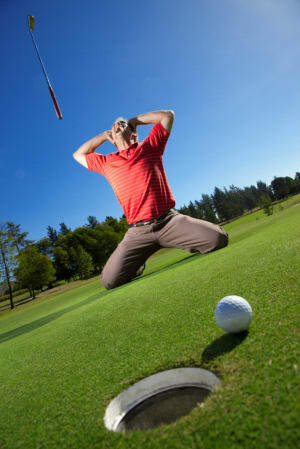 Golf can be a pretty frustrating game at times! Have you noticed that the more frustrated you get, the worse you play? The worse you play, the more frustrated you become! When this happens, your body experiences the frustration as stress, anxiety and tension. And if there is one thing we know in the Pilates world, it’s that tension and stress do not create great movement. Try this little experiment and see what I mean. Tense all the muscles in your upper body and try your golf swing. Then let all the muscles relax and do it again…feel the difference. With tense muscles, there is no flow and there is a tendency to either hold your breath or “brace” and push your abdominal area out. This turns your torso in to a solid cylinder, and you lose the ability to rotate effectively. The Pilates breathing pattern is essentially designed to get the deep breathing muscles co-ordinated with the deep postural muscles and to train your body to breath correctly without you having to think about it and consciously do it. Of course, in the beginning, you will need to consciously learn how to it and then with patience, persistence and practice…something every golfer understands, it will become part of how you move. If you have ever tried Pilates, you’ll have an understanding of how challenging this can be in the beginning, learning to breath effectively isn’t easy, but the benefits are quite astounding. The Pilates breath is what we call “rib cage” breathing. Think of your lungs being like a balloon that inflates and deflates and the more oxygen you need through exertion, the more the lungs need to be capable of this. The rib cage surrounds the lungs and needs to be flexible and trained to expand so the lungs can do their thing. Having a tight upper back, creates a tight rib cage, which effects the lungs ability to expand fully. It sounds complicated, but it is what our bodies are designed to do. So here is a simple exercise you can do to start to understand this breathing principle and to feel the effects of correct breathing. Sit on a chair or on the floor. Take a deep breath in through the nose until you can’t breathe in any more. Do this 5 or 6 times, then stand up and see if you feel a bit more relaxed in the body. Eventually this relaxed feeling is with you all the time, decreasing the overall levels of stress and tension in your body. And as we know…a more relaxed body, leads to flowing better quality movement, which leads to less golfer frustration…which can only be a good thing! This is really just an intro to the Pilates breath. If you would like to learn more, sign up for a FREE Assessment and 2 FREE trial Pilates classes. There’s no obligation, we are just happy to introduce you to the amazing Pilates method of movement.